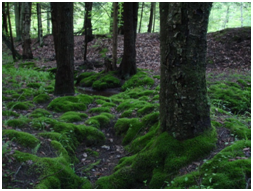 Mosses are small flowerless plants that typically grow in dense green clumps or mats, often in damp or shady locations. The individual plants are usually composed of simple, one-cell thick leaves, attached to a stem that may be branched or un-branched and has only a limited role in conducting water and nutrients. Moss can be killed with products containing ferrous sulphate, ferrous ammonium sulphate, including Moss-Out, Moss-Kill, Rid-Moss, and a variety of Lawn Fertilizers with Moss Control. None of these materials pose serious threats to the environment; in fact iron and sulphur are essential nutrients for grasses and tend to improve their color.